The Un-Official Blog of Romance Author Maddie James: Deer Be Gone! I brought them in this evening from my small suburban, backyard garden. 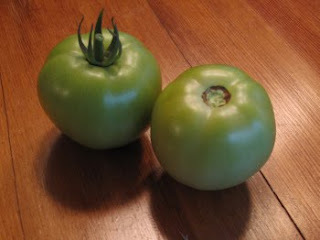 Yesterday, these two green tomatoes had about a dozen siblings hanging around on the tomato vines with them. Tonight, no siblings. Gone. No tomatoes, green or ripe. What? I glanced around. Which of my neighbors...? No. I couldn't imagine that any of them would swipe my tomatoes. Then I stepped away from the garden and onto a half eaten tomato in the yard. Half-eaten. With teeth marks. A deer? Raccoon? I suspect a deer because lately I'd noticed the tops of my hosta flowers broken off, too. And, a green pepper plant that had obviously been chopped. So, now, here I am, with two lonely green tomatoes in my kitchen. I guess I'll fry them up tomorrow evening for dinner. I can only assume that their siblings were lunch today (or a midnight snack) for a deer family. Wait! No! No no no no noooooooo.... Calliope, get away from those tomatoes! Ha, ha!! shoo the kitty away. Fry those suckers up. YUMMMM! Yes, Jennifer. Fried green tomatoes for dinner tonight! I shall not be bested by a deer... again. Maddie- to keep the deer away from your garden- and I know this will sound silly if not disturbing- brush your hair and then use the loose strands from your hairbrush, either around the ground on the outskirts of your garden, or drape it like "tinsel" on the leaves of your plants. The smell of human should deter them from eating anything else you sprinkle the hair on. My MIL told me that after the year rabbits and deer kept eating the tops off my green beans and sure enough, after I used the hair from mine and my daughter's hairbrushes- my plants actually were able to grow without being nibbled away to nothing. And, the best part- hair is natural, so it will deteriorate without causing harm to the environment. :D Hope that helps. Omigoodness. It's hard for me to picture deer in your neighborhood. Wow. Taryn's hair-sprinkling idea sounds like a neat fix, doesn't it? Let us know how it goes. 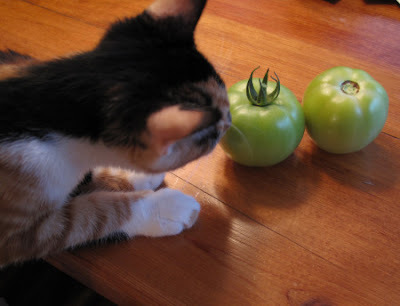 Kitties don't eat tomatoes...do they? Taryn, wow, thank you! What a great tip and I love to keep things as natural as I can. That's one reason I love growing my own veggies and herbs. I am definitely going to do the hair-sprinkle around my tomatoes and hosta! Magdalena, it's interesting about the deer. you would think they would not live in my neighborhood but I think they have been missplaced by all of the construction going on the last couple of years in their grazing area. I saw one while walking the other evening, at dusk, just about a block from my house. He was coming off the golf course. I guess they don't play golf too, do they? I might be wrong, but I think I did see deer playing golf...in FAR SIDE cartoons. Good luck with the garden.